The word “compassion” means “to suffer with”. It means that we suffer with others their own weaknesses. This is what our dear Lord suffered in his humanity: our weaknesses. He took upon himself our infirmities. He took upon himself our sins. Sometimes we are not ready to take upon ourselves the weaknesses and infirmities of others. Often we forget that the weaknesses, the faults of another that make us suffer, also make that person suffer. We fail to be compassionate, which is, by no means, to approve of weaknesses, of faults, of poor behavior, of shoddy responses. But it is to suffer them with someone, and so to suffer with all the world—to be there. Mary wants her compassion known. She is always holding our hands with compassion, suffering with us. She never says, “I have had enough of you. I am tired of this.” We see her throughout history, in most of her apparitions, in one of two positions: with folded hands, praying to her Son; or with outstretched hands, to hold our hands. Then she also wants to make known her succor, her help. “Succor” is a richer word than “help”. It more radically means “rescue”. We have many houses of rescue, in different ways, in our time—houses of affirmation, which try to rescue people in various kinds of distress. We have houses of rehabilitation for people trying to get over drug habits, chemical dependence, and so on. There must be a deeply spiritual house of rescue, of succor. Then she says that they must know about her “shield”. She is going to protect us. She is our Mother Protectress. We, as her little living, sentient temples, must also be little protectresses. We must try to protect all men from self-destruction. We must try to protect all men from shutting themselves into the darkness of themselves, so that they lose their vision. To be a shield is to ward off wrong, evil, and errant thinking in the world, which is so destructive. A shield is what has to take the weapons. Warriors held a shield out against the arrows. It was the shield that took the points. It was the shield that took the suffering. Swords came into Our Lady’s heart because she is a shield, and that is what a shield is supposed to be. This what she still does in all her sentient temples of mercy. The more we are compassionate to others, beginning with those around us, the more we want to succor, to rescue. Surely we would not stand and watch a drowning person going down in the waters and say, “I told him the water was too deep there. I told him not to go in.” Ordinary upright people, who are not dehumanized by a lifelong pattern of self-absorption, will jump in to help. Afterward, the rescuer may have a few things to say to that person! It is succor that is our first response: to save, to rescue. Spiritually, this is even more true. Each time that we let our dear Lord’s compassion flow out through us, our life is gladder and sweeter, and we know it. When, by God’s grace, we have been willing to be a shield bearing the suffering ourselves, we have wanted to rescue, and we have allowed God’s merciful love to stream out through us, then we have been glad, and our life has been very sweet. Our life has never been bitter when we have been kind. Our life has never been sad when we have been compassionate. That is her reward to us, when we really are little temples of her mercy. Our life will be gladder and sweeter each time we carry out her will. Hail, holy Queen, mother of Mercy. 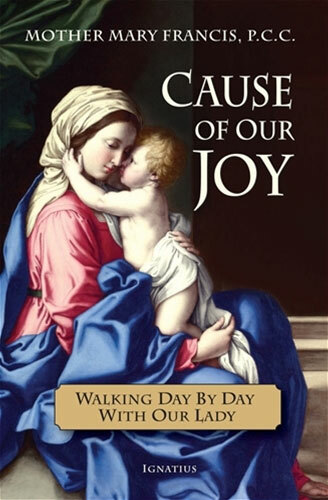 Excerpted from “Cause of Our Joy” by Mother Mary Francis, P.C.C..
"These reflections are an overflow of the author's contemplative union with Jesus and with his Mother. Mother Mary Francis shares from the richness of her own intimate familiarity with the Mother of God, thus drawing the reader into a deeper knowledge of Our Lady and into a more loving relationship with her who is the Cause of Our Joy."